The fine folks who manage Harvard's ginormous endowment have reported their latest annual results, and thus reminded the world that Cambridge's favorite color is not in fact crimson, but green. Last year, the University's cash pile grew by 11.3 percent to $32.7 billion. As Hamilton Nolan wrote it over at Gawker, the school "made Fortune 500 money last year. More profit than Target, and just less than AIG." Harvard is by far the most richly endowed U.S. university. But institutions like the University of Pennsylvania and Yale actually posted even more resplendent returns on their investments. And yet, most of these schools, which are nominally nonprofits mind you, will probably spend somewhere just south of 5 percent of their total endowments this year on things like financial aid and infrastructure. College administrators justify that gap between profits and spending in a number of ways. 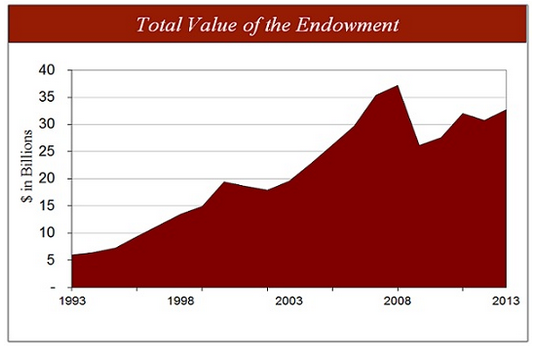 But one of their big points is that endowments are rainy day funds — which is why I've found myself staring at this chart of Harvard's endowment growth over the past 20 years. It's sort of a rorschach test. The University's investments lost 27 percent of their value during the recession, and still haven't made it back to their previous highs. I can easily imagine a college administrator pointing at this and shouting: "See, we need all the cushion we can get!" On the other hand, what an odd cushion. It turns out, the school did face a serious cash squeeze. But that had everything to do with some boneheaded investments in assets that couldn't really be sold quickly — think timberland — not the size of their portfolio, which was never anything short of enormous. In general, schools turned out to be surprisingly unwilling to spend down their endowments during the recession, largely choosing to raise tuition or cut spending rather than touch their nest eggs. That would seem to undermine the whole premise letting them sit there and grow with the help of tax-deductible donations. Every so often, Congress contemplates the idea of forcing the richest colleges to spend a certain percentage of their endowments, the same way non-profit foundations are. Maybe it's time to have one those conversations again.